As of February 2019, the Office of the United Nations High Commissioner for Refugees (UNHCR) registered 5,684,000 Syrians as refugees outside of Syria and estimated that there are 6.2 million internally displaced people within the country’s borders. Most Syrian refugees reside in neighboring countries: Turkey hosts 3.6 million refugees, Lebanon hosts 950,000, and Jordan hosts 670,000. Governments and international institutions have begun to rethink refugee programs as violence in Syria deescalates and becomes limited to a few regions and to assess whether Syrian refugees will be able to safely and securely return home and whether returns should be facilitated by the international community. As of December 2018, a total of 135,000 refugees were reported to have returned—most of them from Turkey, Lebanon, Iraq, and Jordan, with smaller numbers from Europe and North Africa. While there is little data on the fate of most returnees, substantial anecdotal evidence has emerged of harm to refugees who return, including forced military conscription, signature of restrictive reconciliation agreements, arrests, torture, and even death. Syrian refugees displaced by the war face a number of hardships in their host countries. In Lebanon and Jordan, 76–80 percent live below the poverty line, and 87 percent of refugees living in Lebanon are in debt. The Lebanese government restricts the sectors in which Syrians can work, limiting opportunities for employment. In Turkey, an estimated one million refugees work without a permit, allowing some Turkish employers to exploit their labor for low pay in poor conditions. Two-fifths of refugee children in Turkey ages 5–17 are not enrolled in school, and there are not enough teachers to effectively instruct the influx of Syrian children who are registered. In Lebanon, refugees face eviction and discrimination by the local police. The number of Syrians returning home has increased since previous years. In 2018, 56,047 refugees returned to Syria, an increase from the 50,900 who returned in 2017 and the 28,320 who returned in 2016. The reasons behind these returns have been diverse and dependent on the individuals in question; according to a 2017 study by the IOM that surveyed over 600,000 Syrians both returning from other countries and internally displaced, 39 percent of refugees perceived an increase in economic stability in their home region within Syria or a decrease in economic opportunity in their host region, and listed this as their reason for returning. More than a quarter of refugees returned to Syria to secure their belongings and property. While the majority of refugees return for economic security, 11 percent returned for cultural or familial reasons, and the same share returned because fighting had ended in their home region. In addition to establishing the official definition for a refugee, the 1951 Convention Relating to the Status of Refugees establishes the principle of non-refoulement—the right of refugees not to be expelled from a host country or returned to a state if he or she “would be threatened on account of his [or her] race, religion, nationality, membership of a particular social group or political opinion.” Non-refoulement is considered to be a principle of customary law, which makes it mandatory for all states, irrespective of whether or not they have signed the 1951 convention. Per the convention, states are also obligated to afford refugees the same rationing system that exists for nationals; to provide housing “as favorable as possible” and not less favorable than that accorded to alien residents; and to afford the same level of elementary education afforded to nationals, among other things. On the domestic front, the Assad regime has recently adopted or continued to implement a number of legal measures that raise concerns regarding the safe return of Syrian refugees and the resumption of their livelihood in peace. These laws include Law No.19 of 2002, under which peaceful dissidents and journalists have been prosecuted for terrorism; housing and property legislation including Law No.10 of 2018 which threatens to dispossess Syrians of their land and further the demographic changes initiated by the war; and the legal scheme around military conscription, including Legislative Decree No.18 of 2018. With active hostilities becoming specific to only a few regions in Syria, refugees continuing to face difficulties in their host countries, and governments beginning to reconsider their asylum, refugee, and immigration policies, it is likely that the number of refugees who return to Syria will continue to rise. 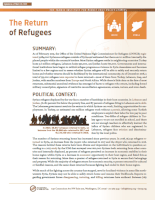 Because the return of refugees is strongly linked to a perception of the war having come to an end, it may be that the rising number of refugees returning under potentially harmful conditions will facilitate the normalization of the Assad regime, the willingness of governments to collaborate with Syria with regards to diplomatic relations and investment, and a greater likelihood of more host governments ending their refugee programs, regardless of guarantees on legal and safe return for all. At present there is insufficient information to fully and comprehensively understand the nature of the risk for returning Syrian refugees, though numerous pieces of anecdotal evidence, as presented above, raise serious concerns. Without increased scrutiny on practices for informing refugees of the conditions and vulnerabilities they may face upon return, and without improved data collection on the situation for refugees who have returned, it is nearly impossible to guarantee that refugees may make a fully-informed and independent decision to return. Should governments and international institutions prematurely encourage returns, refugees may feel pressured or forced to return to an environment that they do not have sufficient information about or that may end up being unsafe, unstable, or even life-threatening for them—raising serious moral and international legal considerations.